April 24, 1967  Three months after the loss of Apollo 1, tragedy struck the Russians too. 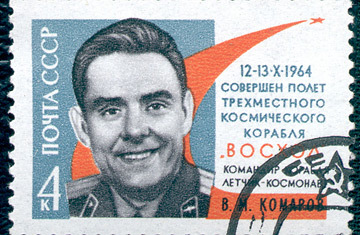 Komarov's Soyuz 1 was expected to be joined in orbit by another manned Soyuz for a docking and crew exchange, but before Soyuz 2 would ever launch, Komarov's spacecraft developed all manner of glitches including  most disastrously  the premature firing of its retro-rockets. The ship re-entered the atmosphere largely out of control. Its first parachute became tangled. Its emergency chute tangled in the first chute. Komarov surely knew he was doomed, and various reports surfaced of intercepted transmissions in which he said, "Heat is rising in the capsule," and cursed the spacecraft's designers. Few other words were intelligible in the static, but the word "killed" was said to have been clear  a statement, presumably, of what he believed the engineers had done to him. He left a wife and two children.